This novel is a debut from author Carew, whose background is in anthropology and medicine. For a young author with a scientific background, this is a well-written fantasy novel and is intended to be the first in a series (Under the Northern Sky). 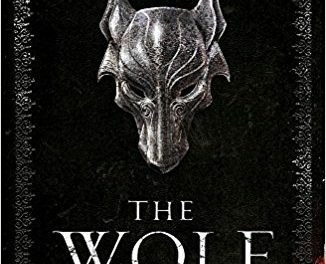 One assumes that the striking cover and the title are a deliberate allusion to A Song of Ice and Fire, and that Carew is therefore well-aware of how much he owes to George RR Martin for his inspiration. At first the parallels are quite distracting: strong female queen, The North vs. 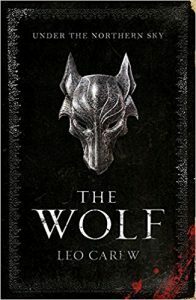 The South, a big wall, but – in Carew’s defence – I managed to put these to the back of my mind after time and enjoy the The Wolf for what it is – a strong first novel, with vivid descriptions of both characters and place, set in a well-thought out other world supported by interesting anthropological details. The story is essentially one of civil war in the country of Albion – North vs. South, Anakim (Northerners) vs. Sutherners. The novel is structured over one year, this one year consisting of numerous battles between the leader of the Anakim – Roper son of Kynortas, known as ‘The Black Lord’ – and Bellamus of Safarim – an upstart Sutherner who uses his knowledge of the Anakim to persuade a weak king to go to war against their age-old enemy. The two sides are well-matched – The Surtherners are greater in number and consider themselves more “civilized” and well-organised, but the Anakim are fearsome – they have ‘bone armour’, are more than 7 feet tall, live hundreds of years, and train for battle from a young age. Bellamus believes he can cross the Abus (the river which separates North from South) and win. Though very different, the two armies prove to be equal and reading becomes like watching a Rocky Balboa fight – exhausting! I have to be honest and say the battles were too numerous and lengthy for my liking, my principle thought being “why?” – why does Bellamus start a war? Why do the two sides set against one another again and again with enormous loss of life with no discernible gain?! Maybe it’s because I’m a girl, with no shred of battle lust in me?! I found it helped to think of Roper/The Black Lord as a Prince Hal/Henry V: a young man forced into a role seemingly against his natural ability, but who finds he’s actually really good at it! The parallels are certainly there – Roper’s ‘man of the people’ approach to leadership, sharing food by the camp fires and trudging next to his men, reminded me very strongly of Henry’s visit to the campfires before the battle of Agincourt. I found Carew’s analysis of what it means to be a leader, a fighter, and a man, one of the most interesting elements of the novel. For example, one of Roper’s principal friends and allies (Gray) aspires to true altruism – he is afraid of conflict and copes with it by pursuing his ultimate aim: of giving his life in battle to save his fellow-men. As well as the Sutherners, Roper must face an enemy in his own ranks – Uvoren, leader of the Sacred Guard, who competes for leadership of the Anakim. As a character he becomes increasingly loathsome as the novel progresses but Roper faces the problem that Uvoren is too useful to kill outright, he must continue to live and fight alongside him for the sake of their people. The strength of the novel is its building of a believable other world and its people; the Anakim culture is clearly based on Sparta but the details of their cultural identity are very strong e.g. the concept of being ‘exposed’, which makes the Anakim feel happy and comfortable, their close relationship to ‘home’, the lack of colour in their surroundings, all give a strong sense of identity. And every detail we learn makes the reader like them much more than the Sutherners! The novel’s main weakness is its reliance on another author’s (Martin’s) ideas, when I don’t feel it was really necessary – there are too many parallels to be simply an homage, but Carew’s story would still be strong if these were removed. Perhaps he used Martin’s ideas as a scaffold on which to build his own story, but these props should have been knocked out when the work was nearly finished, rather than be left, as an over-obvious eyesore, distracting from the author’s own quality workmanship. I also resented the significant lack of female characters! In fairness, those that are there – Roper’s wife Keturah, the evil Queen Aramilla – are strong and well-drawn, but they take ages to arrive and are simply too few in number. I would have liked Carew to throw in a couple of Briennes to make things more balanced, especially on the battle-field. All in all, I enjoyed The Wolf and would recommend it to readers who enjoy the Game of Thrones/Ice and Fire oeuvre – and would advise readers to concentrate on the talents Carew brings to the table, because these are strong and worth reading. I hope Carew gains in confidence for Under the Northern Sky, Book 2 because his Martin props are no longer needed.